Southern California Earthquake Center (SCEC) researchers are working to improve ground motion simulations for California by developing more realistic small-scale models of the earth’s near-surface structure. 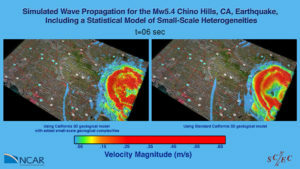 The two animations shown in this visualization compare simulation results showing peak ground velocities at the earth’s surface for the M5.4 Chino Hills California earthquake. For the two simulations shown, all differences can be attributed to the impact of the geological structural models. 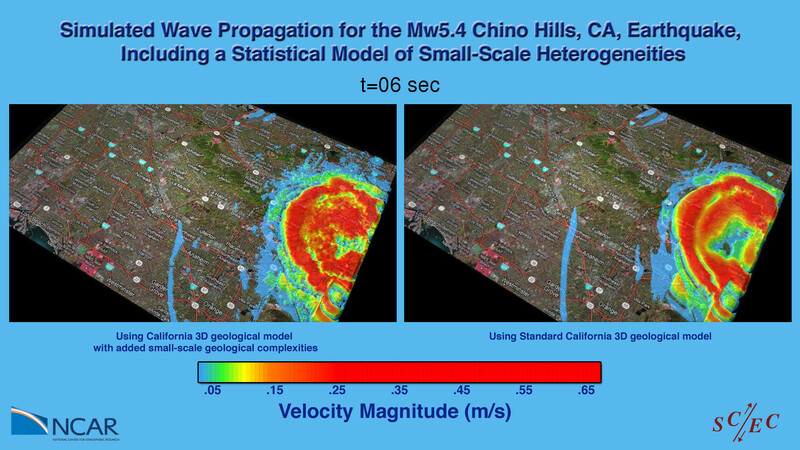 The animation on the right shows a Chino Hills simulations with unmodified SCEC Community Velocity Model (CVM-S v11.2). The animation on the left shows a Chino Hills simulation that uses a modified version of CVM-S v11.2 that contains more realistic small-scale complexities. The animations show that the more complex velocity structure used in the left simulation, clearly impacts that ground motion distribution, the levels of peak ground motion, and the duration of shaking. The next scientific step is to compare both simulation results against observed data for this event to determine which velocity model most closely reproduces the observed ground motions for this earthquake. This research was enabled by NCAR/CISL compute resources. The simulation was run on Yellowstone, a 1.5-petaflops computing system with 72,288 processor cores.